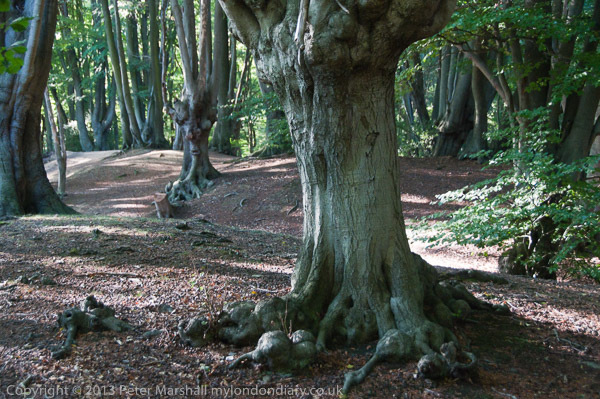 Should you be in the London area and feel a need for some exercise on Sunday September 14 you might consider heading to Epping Forest for the annual Epping Forest Centenary Walk organised by the the Friends of Epping Forest from Manor Park station to Epping. The advantage of going on the organised walk is that you meet people and there “will be ample stops and pauses when short explanatory talks will be given on the Forest and its management and history in furtherance of the Walk’s objective to promote the appreciation and knowledge of this priceless Open Public Space!” You also won’t get lost, which is rather easy to do on some sections of the walk. There are timings given on the site linked above for those unable to walk the full 15 or 16 miles. 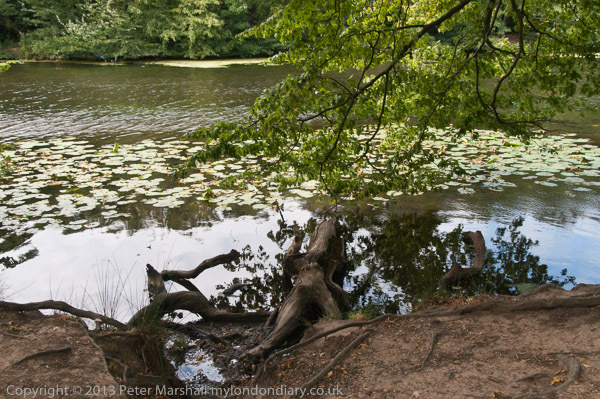 But if you want to take pictures, it is probably better to walk it on your own, or with a small group of friends or family as I did in 2009, though it has taken me 5 years to put the pictures on the web – at Epping Forest Centenary Walk. And of course you could split the rather long 16 mile route (and longer when you get lost or wander off to take photographs) into several sections. Something I’d heartily recommend as I was more than shattered by the time we reached Epping station for the journey home. I was calling it Effing Forest by the time we finished. 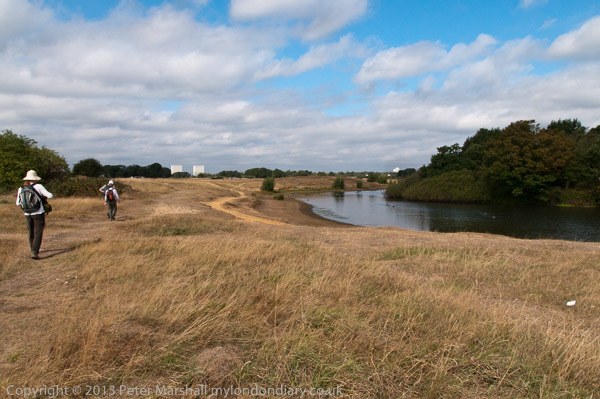 It would make two rather nice walks, splitting the route at Chingford. You could even make a short detour to some interesting parts nearby – such as Pole Hill, which has a pole, or rather an obelisk which was erected by an astronomer royal on the Greenwich Meridian so he could line up his telescope from the Royal observatory and make sure it was pointing due north. Some time later they decided to move the meridian a few yards, though I suppose if the telescope was still in the same place it didn’t really matter. 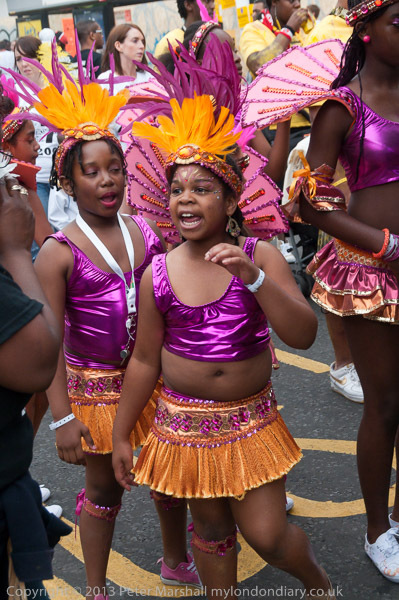 I’ve now put more of my pictures from Notting Hill Carnival in 2009 on-line in Notting Hill – Children’s Day on My London Diary. Though as you will see there, they are not all of children, though I have concentrated rather more on those of children in selecting images to put on the web. 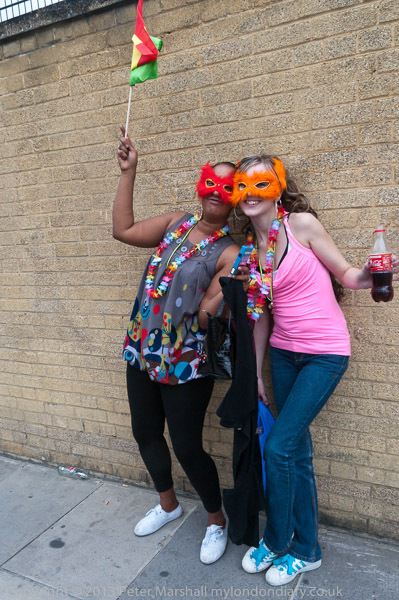 But carnival is a great event for people of all ages. I took a great many pictures that day, almost 1500 in around 4 hours in Notting Hill, which works out at around one every ten seconds, though I’ve put less than 50 on the web. They probably include most of the better images I made, though I didn’t go back and look through all of them to make the selection, just the 200 or so I’d developed from the RAW into jpegs at the time. There may be a few images that I missed when I did that initial edit, but I doubt if there would be anything truly stunning. With digital I ruin far fewer images than I used to on film, but I doubt if I make any more good ones either. So while I still have almost every negative I ever took, it perhaps makes more sense to be at least a little selective about which digital files to keep. 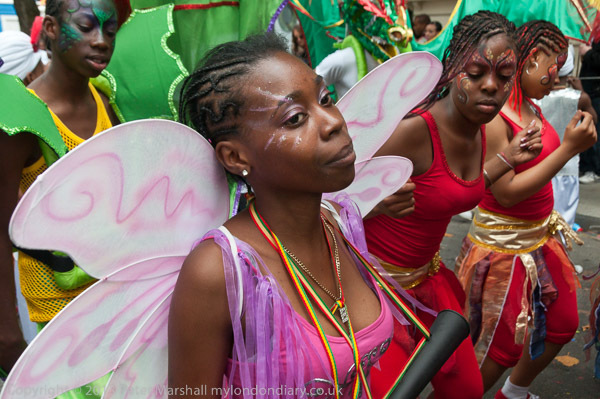 Another forty-something pictures of Notting Hill – Children’s Day from 2009 now (at last) on My London Diary. When I taught photography, many of our best students were women. Perhaps over the years there were half a dozen who I thought really had potential as photographers, but I can only recall having that same feeling about one male student. As it happens he is the only one who has gone on to become really successful as a photographer, though others who passed through our classes with less obvious photographic talent have made a living behind a camera. As Eric Barker puts in in his Time article on careers, “Persistence trumps talent”. Or perhaps it is rather harder for people who have a definite personal vision find to produce work that fits the dimmer perception of others. Many of the contemporary photographers whose work I admire are women. I’ve never thought to check what percentage, but certainly many come to mind, not because they are women but because of their work. Where perhaps in the first hundred of so years of the history of photography women were notable exceptions – because of wider societal restrictions and conventions – this is no longer the case. And some of those exceptions were truly notable – including such examples as Julia Margaret Cameron, Berenice Abbott and Dorothea Lange. Wikipedia has an interesting list. When I was teaching and when I was writing about the medium for a living I wrote about and used examples from the work of many women photographers, some well-known, others less so. Many of our students were inspired by the work of Diane Arbus, Cindy Sherman, Nan Goldin, Sally Mann, Jo Spence, Fay Godwin and others – as well as that of male photographers. I wrote as well about others who I felt deserved to be better-known – such as Nelly’s and Grete Stern (neither well-served on the web) and about a few others who were well-known but whose work I could not relate to or felt rather lacking in photographic interest. Although I mainly wrote about things I liked, I was running a site which I felt had to provide at least basic information across the whole range of things photographic (though I drew a line at so-called “glamour”.) 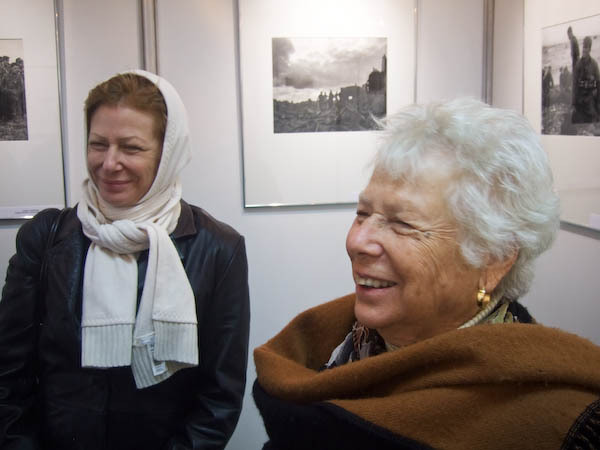 But there were a few women photographers whose reputation seemed to me more connected with feminist politics than artistic production, though this was and is dangerous territory for male comment and I largely restricted myself to giving the facts and links rather than opinions in their cases. It was a link to an article posted by Alan Griffiths of Luminous Lint that started me thinking about “women photographers” again. In Hyperallergic, Alex Heimbach (a freelance writer and graduate student at NYU) reviews a recent book with the title ‘Women Photographers from Julia Margaret Cameron to Cindy Sherman‘ under the heading How Not to Write About Women Artists. The photographers – who are arranged alphabetically, itself a curious choice, begin chronologically with Anna Atkins, who, while an important figure in the history of photography, was probably not a photographer. Her Photographs of British Algae: Cyanotype Impressions, its first installment published in 1843, is considered to be the first photographically illustrated book, using the cyanotype process invented the previous year by her friend Sir John Herschel and the photogenic drawing technique she had learnt from another friend, a Mr Talbot. Quite likely she had learnt his calotype process from him as well, and may have been the first woman photographer, but no evidence of this remains. The Wikipedia article on her provides a rare link to a piece I wrote about her work in 2005, rather a flashback for me. Among the 55 photographers in the book by Boris Friedewald listed on the contents page (which you can view on the ‘Look Inside!’ page at the Amazon link above) are around 40 that I have at some time or other written about, one I know personally, half a dozen I’ve not heard of and a similar number who I feel certainly don’t deserve inclusion. There are quite a few – including Atkins who perhaps fall outside the remit of the title, the others being from post-Sherman generations. You can also see the pages on Berenice Abbott and Eve Arnold in the preview. I started writing a while back about the monkey who snatched a camera from a wildlife photographer and started taking pictures, but somehow the article never got finished. I can’t remember why, but suspect it wandered into musings about ‘monkeys‘ and ‘blunts‘ on Fleet St (remember Fleet St?) and the esoterica of copyright and slowly faded out in a million diversions. Quite a few of the things I write rather end that way, though just occasionally I’ll scrape them up and tighten them enough to see the light of day. Or maybe I just fell asleep when writing it and forgot to save it when I woke up. You’ll have read about the monkey selfie. If not, read it here. The picture and story went viral in 2011, but what brought it back to attention in 2014 was the attempt by the owner of the camera, David Slater, to get Wikipedia to take down the picture on the grounds that rather than being, as Wikipedia stated ‘Public Domain’, it was copyright and that he owned that copyright. Wikipedia, after its usual long process of internal discussion, disagreed, arguing that under US Copyright law a photograph has to be taken by a human being to be copyrighted. And a recent post in ArsTechnica confirms that US Copyright Office agrees: a “photograph taken by a monkey” is unprotected intellectual property. “Under UK federal law, however, Slater could claim the intellectual property rights to the picture—even if he didn’t press the shutter—if the image is part of his “intellectual creation. They go on to say that it is something that has never been tested in court, and it would seem to me not to apply in this case, where the snatching of the camera was clearly the monkey’s idea and not the intellectual creation of the photographer. The photographer’s intervention came only after the act. In the ‘New Yorker‘ you can read what the monkey thinks of it all, at least according to Bill Barol. It actually contains a piece of good advice that many educational establishments in this country should heed, that “digital really lets novices shoot with abandon, and this the best way to learn” and that monkey does seems to have learnt fast, which an image that puts most human selfies to shame. Perhaps it’s a pity the camera was taken away from him, who knows what he might have gone on to produce. 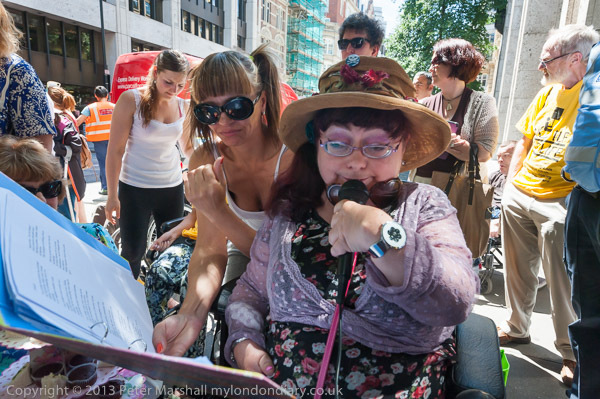 Some of the people that I photograph amaze me in various ways, and among the more amazing are many of those who take part in the protests organised by DPAC (Disabled People Against Cuts) who have regularly shown others how to organise effective and powerful protests against unfair attempts by the government to cut welfare benefits. They have been hit much harder by various cuts in services; many have suffered from the work capability tests – tests that were designed to be unfair and were then poorly administered largely by unqualified staff pressured by a company which had been given financial incentives to fail as many as possible. But although ATOS’s failings have received some media attention (largely thanks to DPAC’s protests) this is only a small part of what DPAC rightly describes as “a national scandal”, which they accuse mainstream media of failing to report. “the media owes a duty to the wider public to give way to propaganda and needs to out this scandal for what it is. 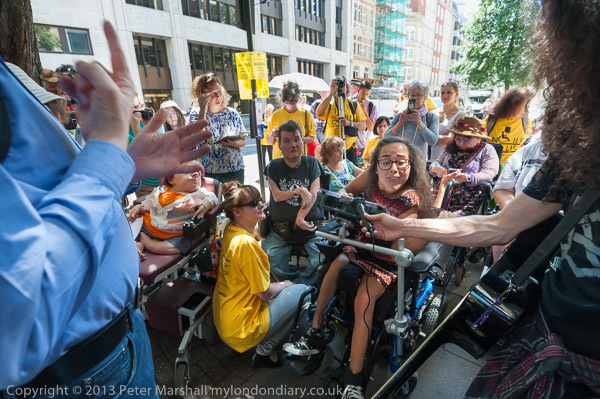 It’s hard to avoid the conclusion that Iain Duncan Smith thought the disabled would be an easy target, unable to stand up for themselves, but how wrong he has been proved to be. Hard too not to be convinced that there has been something of an unwritten conspiracy between the newspapers and mass media and government to play down or ignore the problems that government policies are causing – and because Labour too see a need to reform the welfare system they have avoided the duty of any opposition, although a few individual politicians have stood up for the poor and disabled. Media owners and governments share various interests, are closely intertwined in various ways, depend on each other. It isn’t because journalists have not exposed the facts, written the stories and taken the pictures, but that those who control the media have decided they are “not news”, and mainly they only get published in personal blogs and fringe publications. The BBC has lost much of its reputation for independent reporting – at least of UK events – because it seems now to be more concerned about cosying up to government to avoid losing the licence fee than speaking truth to power. 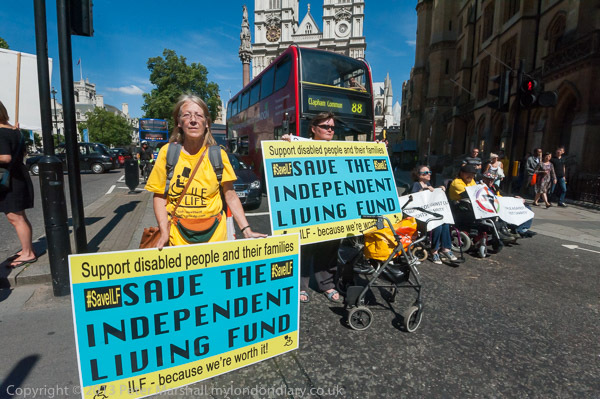 This protest – a tea-party on US Independence Day -was about the ending of the Independent Living Fund, which gives those who desperately need it the extra care which enables them to live in and contribute to the community. You can read more about it in an article in The Guardian, one of the few papers that has sometimes shown an interest. 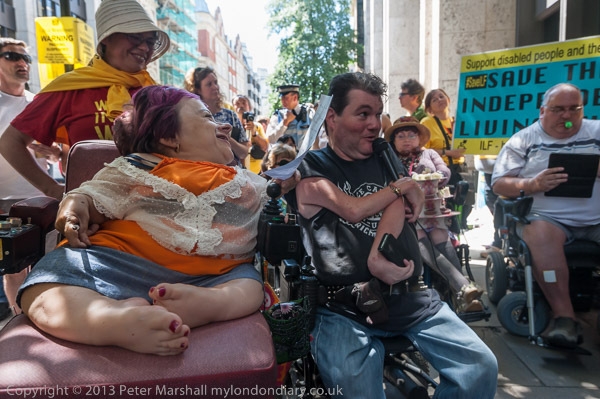 But this and other stories about what is happening to so many of the poor and disabled, affecting altogether many more of the people of this country than the four million should regularly be making headlines across the media. Instead we get huge stories about wacky politicians, faded performers, unknown celebrities, footballers and their wives and the rest of the largely salacious nonsense. Even across the BBC and the so-called ‘quality press’. Photographically there were few problems for me. It was a very crowded situation, and at times very difficult to move – even the few inches needed to frame as I would like. At times I was shoulder to shoulder with a BBC cameraman (not working for the news) and that restricted my view and I had sometimes to use a longer focal length than I would have liked to avoid his lens blocking part of the picture or a large woolly covered microphone (a ‘deadcat’) wandering into shot. Doubtless too I got in his way, but in the confined space we had to work together, and did so with no real problems. In tight situations, the 16-35mm is a great lens to have, though just occasionally the 16mm fullframe fisheye is better. But here I didn’t really have that option when I wanted to use it, both because the guy with the TV camera would have occupied too much of one side of the frame, but for a much simpler reason – there just wasn’t the space to get into my camera bag and to change a lens, we were so squashed together. 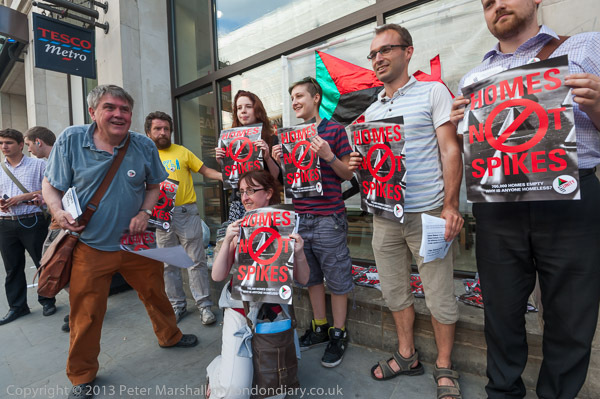 I hung around at the end of the official end of the protest at the DWP because I knew something else was likely to happen, having been given a hint by one of the organisers. I didn’t know what this would be, but wasn’t surprised when around half of the protesters decided to block nearby Victoria St – the busiest road nearby. At the front of a queue of traffic held up by the protesters in front of Westminster Abbey was a number 88 bus, headed for Clapham Common. At last I thought, the message is getting through to the “man on the Clapham omnibus”. 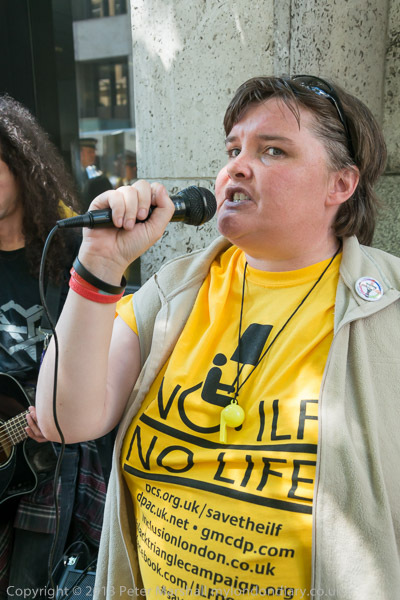 I’d thought too that the direct action might involve Westminster Abbey, who had called in police to turn away DPAC protesters the previous Saturday. The protest did however take the police by surprise and it was a few minutes before they arrived and started to divert traffic away. At one point they got protesters to clear a path though one of the two carriageways for an ambulance – but it never arrived, though I think it more likely that it had been diverted than that this was police subterfuge. So today I’m going to forgo the Red Stripe and dancing on the streets, and tomorrow at least I will still have my hearing unimpaired. 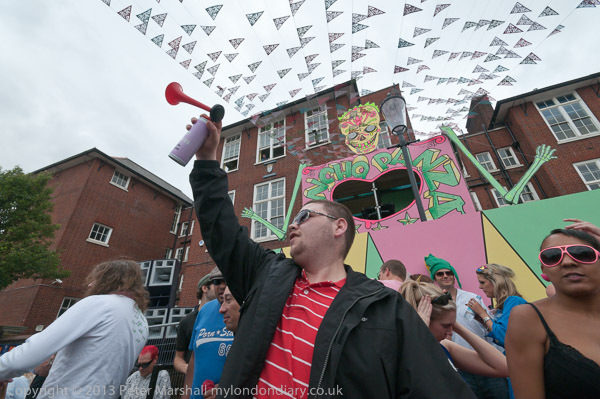 Back when I used to spend both the Sunday and Monday at carnival it would take me three or four days to recover, and probably suffered a little long-term hearing loss. 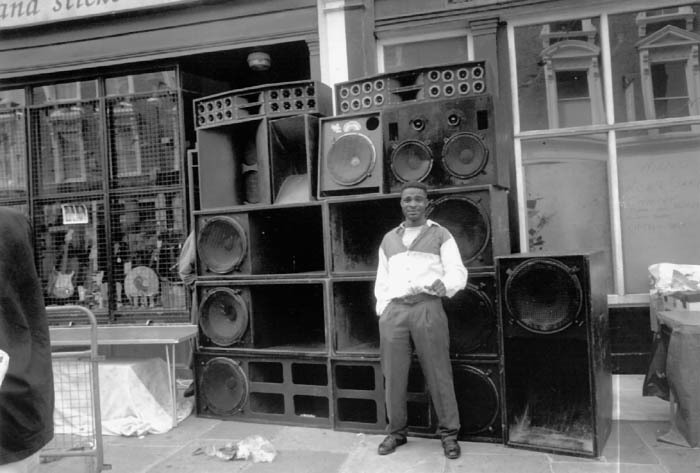 You don’t just hear some of those truly giant sound systems, you feel them in your feet as the tarmac pulses to the beat and in your body as your vital organs move with it. And you dance even as you take pictures. 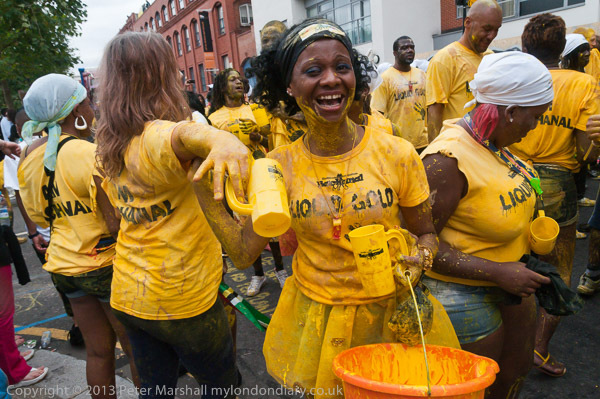 It wasn’t until 1991 that I first went to carnival. Living a little outside London I had been put off by the scare stories carried by the press about violence there, a few of them true. With perhaps a quarter of a million people packed onto the streets there were always a few incidents but in general the mood is mellow. People are there to enjoy themselves, but if you are careless with your wallet in any large crowd it can disappear. 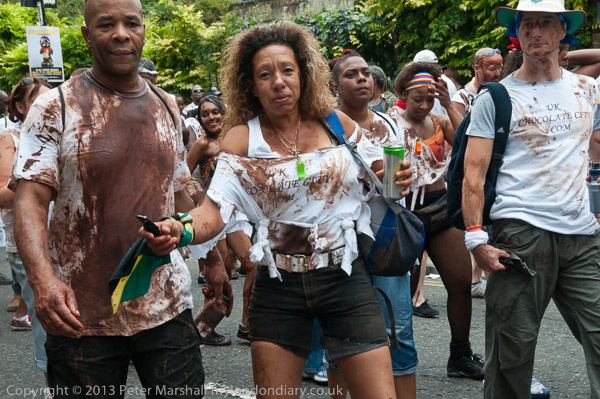 I have my own little story, one year when I was in a crowd of dancers at a sound system just off Ladbroke Grove – which I wrote about last time I went to Carnival in 2012. Last year I was a few hundred miles away in Yorkshire over the holiday weekend and missed the event. It did seem very quiet up there. 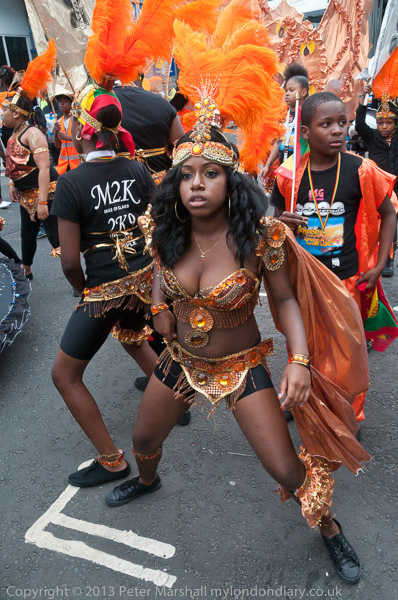 Other than 2013, the only other year I’ve not been to carnival was 2005, when a minor but very painful knee injury stopped me. I tried to get there, but by the time I’d dragged myself the quarter mile to my nearest railway station was in such pain I had to give up, resting for a while before managing to make my way home. 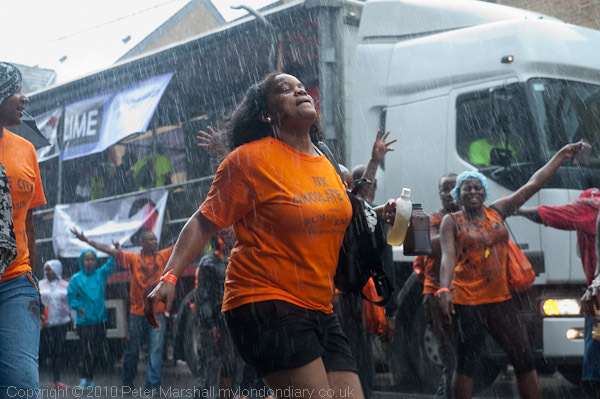 One of the first sets of pictures I put on-line were from carnival, and these are still there on a site called Fixing Shadows, and some of these were also in my contribution to an exhibition a few years ago, English Carnivals, which has rather improved scans. 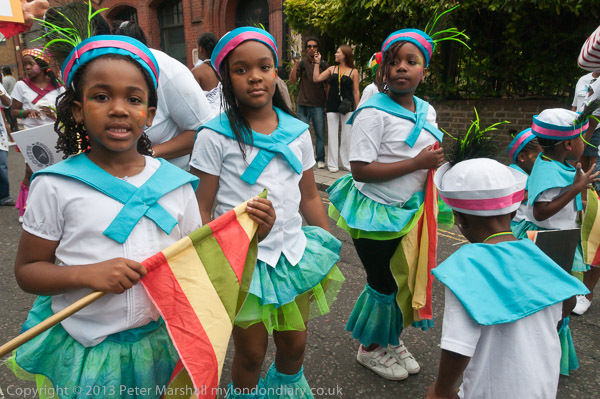 But in writing this piece, I discovered that somehow I’d never managed to put the pictures that I took on Childrens’ Day in 2009 onto My London Diary. I’ve also never added those from the following day when a few of us walked the 15 mile Epping Forest Centenary Walk – which you can do annually together with the Friends of Epping Forest (the 2014 walk is on Sunday 14 Sept) at a slightly more leisurely pace with less chance of getting lost and some explanatory talks en route. But perhaps I was just too tired after those 15 miles to put the work from the two days on-line. 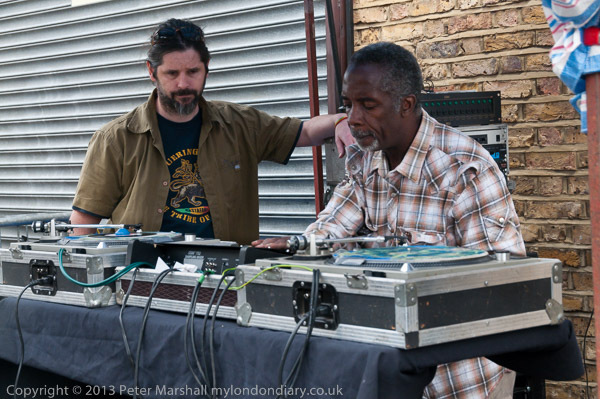 But included here are a few pictures from Notting Hill in 2009 that I’ve not posted before. 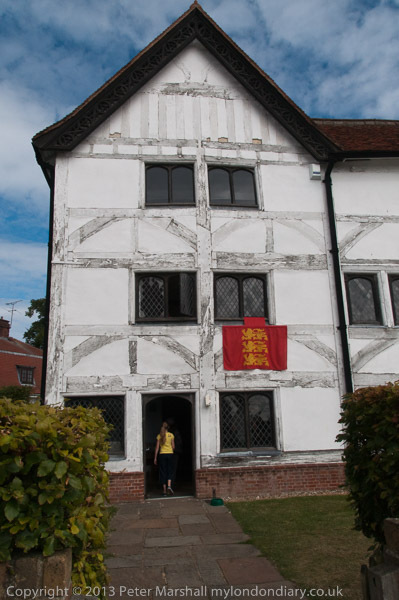 All were taken on a DX format Nikon D300, mainly with a Nikon 18-200mm but some with a Sigma 10-20mm. A Facebook post by Dayanita Singh who I mentioned in the previous post and which was reposted to me by curator Peggy Sue Amison reminded me of a fine site by Richard Benson, The Printed Picture, which I’d not looked at for some years. Indeed there is much on the site I’ve never looked at all as the entire talk by him on it takes 8 hours, but is fortunately split into short digestible sections such as ‘Black and White Inkjet Printing‘. Text and some examples accompany each of these short videos. It isn’t a ‘how-to guide’ and some of the technical details are rather vague, but it is a grand overview of everything to do with printing images from marks on cave walls to modern times. Be warned it is an addictive site and you may find – like me – you spend more time on it than you really have. The text on the site comes from the book, The Printed Picture (New York: The Museum of Modern Art, 2008 and still apparently available from the MoMA store – though cheaper elsewhere) and an exhibition of the same name at The Museum of Modern Art in 2008-9, so is not completely up to date with the latest developments in ink-jet printing. Richard Benson started as a printer which led him to take an interest in photography, and as his biography at the Pace/MacGill Gallery (where you can also see his photographs) states “has been instrumental in revolutionizing the technologies and standards for photographic reproduction in ink“. Among many fine works that have benefited from his expertise are over a dozen Lee Friedlander monographs and the monumental ‘The Work of Atget‘, 4 superbly produced volumes published by MoMA in 1981-5. But almost every finely reproduced photographic book in the last 40 or more years owes something either first or second-hand to his work. You can read an interview with him by John Paul Caponigro, first published in 1997 in View Camera magazine on Caponigro’s site. I read the article India’s 10 best contemporary photographers you should know on World Photography Day and it set me thinking about Indian photography, and also about lists such as this. World Photography Day may have passed you by – it almost did me – but it is a project started by a young Australian photographer in 2009, “with the dream to unite local and global communities in a worldwide celebration of photography.” The day chosen was August 19th, the anniversary of Daguerre’s patent being purchased by the French government and announced as a gift “Free to the World” in 1839. Except for Britain, where Daguerre had separately acquired a patent for it 5 days earlier. So it isn’t perhaps a very suitable date for those of us in the UK to celebrate. But there were a number of events to mark World Photography Day, although I could only find five – and those rather obscure – marked on the world map on the web site. One not listed was at the Indira Gandhi National Centre for Arts in Mumbai, where Drawn From Light, an exhibition of the early photographic history of India opened, with one of the ten from the list, Dayanita Singh, as guest of honour. There was also a display of 40 vintage cameras, including a daguerreotype camera, part of Dilish Parekh’s collection of 4,425 cameras. And I sometimes think I have far too many. The exhibition is from the Alkazi Collection of Photography, which is extensive, and has formed the basis of a number of publications, but has relatively little material online. Lala Deen Dayal (1844-1905) is one of relatively few photographers to have been honoured by a postage stamp issue, and I was very pleased to receive a commemorative album from his great granddaughter who runs the web site about his work containing examples of the 500 Rupee stamp issued in November 2006. Few photographers can claim an edition of 0.4 million! There are still a number of links on the web to the pieces I wrote about him and several other photographers working in India, even though these have been unavailable for seven or eight years, for example at Harappa.com, which does still contain much interesting material about India and Indian photography. So I thought I might revisit the article about Lala Deen Dayal, and try and bring it a little up to date. Mostly it is as I wrote it in 2003. 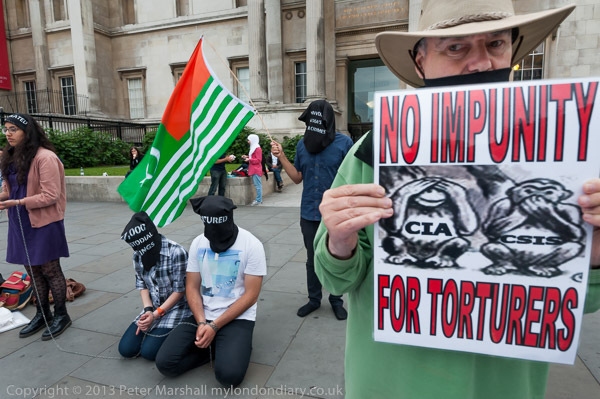 Unfortunately I’ve been unable to find some of the actual photographs I wrote about that were available on the web back then – please post links in the comments if you can do so. 1844 Lala Deen Dayal was born to a Jain family, following one of the ancient religions of India (dating back almost 3000 years) in 1844 in Sardana, near Meerut, a small town in north India. 1857-8 Meerut was the scene of the first serious rioting in the 1857-8 uprising (the ‘Indian Mutiny’) and the events will doubtless have made a strong impression on the 13-year old Deen Dayal. ca 1861 Dayal studied enginering at the Thomason Civil Engineering College in Roorkee (now the University of Roorkee), the first engineering college in the British Empire (and only the third in the world) set up in 1847 by to train Indians to provide the roads, railways and other infrastructure needed for the exploitation of the country’s resources. Dayal was apparently a brilliant student, covering the five-year course in only three years, emerging with a first class degree and an almost perfect mark. It was while here in 1863 at the age of 19 that he first learnt photography. 1866 After graduating, he started working for the Indian Civil Service at the Department of Works Secretariat in Indore, as a draftsman and estimator. He continued to photograph and was encouraged by some of the British civil servants, in particular Sir Henry Daly, the Agent to the Governor General for Central India. 1875 Daly commissions Dayal to photograph the royal visit by the Prince of Wales. Later he takes him with him to photograph on a trip to Bundelkhand. 1882/3 Dayal returns to Bundelkhand with the new Agent, Sir Lepel Griffin. 1885 Dayal photographs the Viceroy of India, Lord Dufferin, and his wife, Lady Dufferin. They are so impressed by the quality of his work that they appoint him as official photographer. Dayal resigns his civil service job to become a full time photographer. He moves to Hyderabad where he becomes court photographer to the Mir Mahbub Ali Pasha, the sixth Nizam and opens a photo studio at the nearby military station of Secunderabad, the largest in India, where there was a great demand for portraits. The Nizam awards Dayal with a knighthood for his photographs of him, giving him the title of Raja Musavir Jung (‘Bold photographic warrior’), although Dayal only uses the first name, becoming Raja Deen Dayal. late 1880s Opens studios in Bombay and Indore. His two sons, Lala Gyan Chand and Raja Dharam Chand both work for the business, Raja Deen Dayal & Sons, as photographers. 1892 Opens Zenana (women only) studio in Hyderabad, supervised by the wife of the Times Correspondent, Mrs Kenny Livick. 1893 his display of views of India received a special award at the World Colombian Exposition in Chicago. 1897 Queen Victoria granted the firm a Royal Warrant. 1902 Dayal photographs the visit of Lord and Lady Curzon to the Nizam. Lord Curzon was the Viceroy (governor) of India, and his wife was an American heiress, daughter of Levi Leiter, the founder of Marshall Field’s. Some of Dayals best-known images show their tiger shoot. 1904 His son, Raja Dharam Chand dies. 1912 Nizam Mahbub Ali Khan dies. 1919 Lala Gyan Chand dies. For the next 15-20 years the business declines until Ami Chand is old enough to turn its fortunes around. His work includes an extensive record of the era of Nizam VII Mir Osman Ali Khan. 1987-92 Amichand’s daughter Hemlata Jain organises exhibitions of the work by Dayal using prints her father had preserved, in Bombay, London and Pune. 1984 Amichand dies. His sons continue to run the photographic studio in Hyderbad. 2002 The Deen Dayal web site, is put on line by his great grand daughter Hemlata Jain. Much of the information in this feature comes from this site. Although Lala Deen Dayal had an immense reputation in India as well as being recognised abroad during his lifetime, there are relatively few mentions his work in the main histories of photography. Only since the exhibitions around 1990 and in recent years with major shows on Indian photography in general has his work begun to get some of the recognition it deserves. Part of the reason for this may lie in his identification as a photographer of the colonial era. Following the successful completion of the struggle for independence in 1947 there was perhaps a desire to forget the excesses of the past, some of which are evident in his work. Dayal’s success was founded on technical excellence and hard work. He was apparently a deeply devout and hard-working man, often putting in an eighteen hour day to ensure the success of his business. The evidence of the pictures very much shows him to have been a perfectionist, striving for every detail to be perfect. The meticulous attention to detail is very much evident in the group photographs that he made. One of the more fascinating was taken on May 22, 1892, which shows Nawab Ghalib Jung and friends, including several European (or, most likely, American) women in white dresses with white hats, in a group of around twenty people gathering around and apparently listening with delight to that new-fangled state of the art American treadle phonograph, complete with long tubes to carry the sounds to the more privileged of their ears. It is a carefully posed group with a lively sense of animation. Dayal’s India was very much an India of colonial occupation. Many of his portraits were of the soldiers, civil servants and their wives who were in charge of the country. They were the ones who could afford his services. As court photographer to the Nizam, he was working for a man supported by the colonial administration, with a lifestyle that was very much modelled on the English upper classes. His palace (photographed by Dayal) was very much in a European style, both in architecture and in its furnishings. His view of the interior of the Nizam’s palace shows a galleried sitting room with grand curtains and heavily ornate chandeliers, in the most extravagant of nineteenth century European taste. The decorated ceilings and walls, and ornate padded furniture all show the Nizam’s immense wealth. Dayal’s careful choice of camera position and the fine natural lighting, doubtless with some help in the darkroom as well as possibly the use of mirrors to direct more light towards the ceiling make this an impressive and very clear picture. Of course there are Indian aspects in the photographs of the Nizam and his court, with some of the visitors in Indian dress, but at times it seems a parody of the excesses of a European aristocracy rather than an authentic nationalism. Dayal himself of course was simply the photographer, engaged to record the events, and whether the occasion was a soiree or a tiger shoot he did so with great care and precision. Dayal’s ‘Street View of Ulwar’ is taken from a high viewpoint looking along a main street of the town the capital of Ulwar state (now known as Almar.) On the left side of the image is the shaded side of the street; Dayal is roughly at the level of the tops of the roof of the nearby building, perhaps a temple. On the right of the picture, the deep street is fringed by shops with taller light stone buildings behind them. The sunlit street is busy with people, in its centre what looks like an early car, although the date of 1882-6 makes this impossible – perhaps it is a rear view of a horse-drawn vehicle. The shops have awnings to shade them from the sun and the street is busy with people. In the distance we see a fort, possibly the photographer and his camera are standing on top of a similar one. Further on, we see the mountains towering above the town, and, above them a dramatic cloudscape. Dayal choose a dramatic viewpoint for his picture of the ‘Chichai waterfall’ in 1882, making the most of a drop front on his camera to put the horizon very high in the view. His viewpoint is actually from a slightly higher point than the top of the falls, giving a view back along the top of the plain along which the river runs until reaching this apparently enormous drop. The slow shutter speed used – probably something between 5 and 20 seconds – gives the water a blurred, almost ethereal quality that increases as it falls and perhaps spreads out giving more spray. In contrast, the river at ‘Indore’ is smooth and glassy as it flows through a grove of palm trees, languorously curving out over the placid stream (again an effect increased by the long exposure used.) The diffuse light emphasizes the near-silhouettes of the trunks and fronds against the plain sky. The east scarp of ‘Daulatabad Fort’ rises steep and unassailable ninety metres from the stream below, and the photographer has chosen a viewpoint where he appears to be hovering in mid-air to view the scene. In the foreground, filling most of the right of the picture, it towers above the more distant plain in the left half of the picture, starting far below the camera and stretching into the distance. The scene is a thrilling combination of horizontal and vertical, with an aerial perspective that enhances its effect, and creates a hovering bulk of distant mountain on the horizon below a radiant sky. The fort, built by Hindus in the 12th century in this imposing position, was one of the many properties belonging to Dayal’s employer, the Nizam of Hyderabad. Some of the more engaging of Dayal’s pictures – at least to a western eye – are those of elephants in action. The broad sweep of landscape below the fort in his ‘Elephant Battery in Action’ at Fort Jhansi, with clouds of smoke, groups of men, elephants, bullocks and cannon create the effect of some the filming of some battle epic. Among the other pictures of this subject on the Deen Layal site is a picture of the Nizam himself under a wall covered with the skins and some heads of the tigers he had shot, probably around fifteen or twenty, standing proud with his gun under his arm. Also on the Deen Dayal site are a number of fine portraits by Dayal, and in the ‘Heritage’ section, images of ancient monuments from various towns and cities in India. Fairly large numbers of some of Dayal’s pictures were probably produced, especially for those that he made for the Nizam, who apparently often presented his visitors with albums of them. He also sent an album to Queen Victoria, who was delighted to receive these images of a vital part of her empire she never visited. The largest existing collection of Raja Deen Dayal photographs is apparently housed at the Indira Gandhi National Centre for the Arts in Mumbai, having been bought by the Indian Government. Exit was the most significant single documentary project in UK photography in the 1970s (if not in the whole century), and although it gained some publicity – and a showing at the Side Gallery in Newcastle (home to most of the rest of significance in the genre in this country) in 1982, as well as publication by the Open University of ‘Survival Programmes in Britain’s Inner Cities‘ (ISBN-10: 0335101119) in the same year, it soon disappeared in the morass of theory than engulfed British photography in the lost final decades of the twentieth century. Documentary was old hat. Seen as outdated, lacking in discursive mumbo-jumbo the project failed to be recognised and legitimised by academic flummery. And although the OU got some funding from the Arts Council, the two testimonials on its rear cover come from Peter Townsend, Professor of Social Policy at the University of Bristol, the leading sociologist of the era and Chris Hamnett, Lecturer in the Faculty of Social Sciences at the OU. The academic photography establishment preferred to hold its nose and look the other way, largely towards its own navels. This was work in a tradition that many – largely those who were ignorant of it and had failed to understand it had rejected. But it was also fresh, compelling and highly political. And it was probably most importantly the political nature – telling the truth about our inner cites – that made it too hot to handle for the major galleries that should have shown it. We all did some work in London as we all lived there, and we all did some work in Glasgow, but most of Paul’s time was spent in Liverpool, Nick’s in Birmingham and mine in Newcastle, Middlesbrough and Belfast. His article also gives a good idea of the shoe-string nature of the project, and how the photographers worked, and of the importance of the interviews along with the photographs. The first image on his Magnum portfolio is from Belfast in 1979. 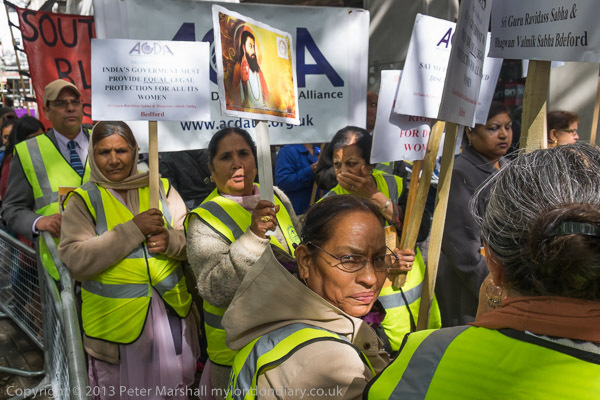 I first met Paul Trevor in the’80s and went to several events where he showed and talked about his work, in Survival Programmes as well as in East London and in India, and I was highly impressed. But it was only in 1997 when I reviewed a book giving a very one-sided view of the magazine ‘Camerawork*‘ (not to be confused with Camera Work!) which Trevor had been one of the nucleus from its first issue in 1976 that I got to know him personally. I sent him my draft review for comments, and as well as correcting some of my misconception he also contributed his own review to the small magazine, LIPService, I was then editing for London Independent Photography. You can read the text of my review for ‘Visual Anthropology Review‘ on-line and the final article with illustration here if you have a Wiley Online Library account. Though why they should charge for accessing my work without giving me a share is something of a mystery. The following year ‘Visual Anthropology Review‘ published a feature with 20 of my pictures from the Notting Hill Carnival with text by George Mentore (my name does not appear in the abstract – and again you pay but I get nothing) and also an article by Dale Newberry, ‘Photography and the visualization of working class lives in Britain‘ (same terms) in which Trevor’s work was featured, and I was rather surprised to find how little known his work was at that time in the USA. I got the front cover of the magazine, with a rather better image by Trevor on the back. More recently, I wrote about his work in Liverpool and the book and show there in 2011, Like you’ve never been away. It’s a nice book, with much better photographic printing than Survival Programmes, though with its portrait format some of the images disappear rather disastrously down the gutter. Grain, the new Photography Hub and Network for the West Midlands at the also new The Library of Birmingham, has recently acquired a collection of over 250 vintage prints from Exit Photography Group as a gift from the the Calouste Gulbenkian Foundation who funded the original project, although I think there are only 3 pictures – one from each photographer currently on line. There is a large collection – 125 pictures – of Paul Trevor’s work from Liverpool – reproduced from his contact sheets in a rather strange sepia – on Flickr. * Camerawork is now apparently rare. I just found a bookseller offering a copy of a single issue for £32.95 (+ postage). I have an almost complete set and gave away some spare copies… You will be lucky to find a copy of Survival Programmes for less than £100 too. 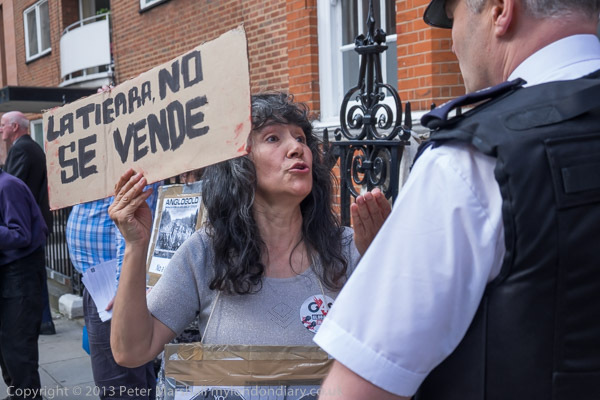 I finished putting my work for June on-line at My London Diary a couple of weeks ago, and have also now written posts here about those events I felt I had something to say of interest about. But although as I write August is halfway over, I still haven’t found the energy to start putting July’s events onto my diary. Perhaps it will happen today, perhaps later in the week. I see My London Diary as a record of some of the details of my life here and the events I cover rather than just the day to day reporting. It covers a wider range of posts – including some things which definitely aren’t news, like some of my walks and holidays – and goes into more depth telling stories through pictures than the selected images which are almost always uploaded the same day – if never as fast as Demotix and other agencies would like. Its an archive of my work rather than news, and largely a record of particular subcultures in a city in a particular era, and one that reflects on wider world issues. So although I think it important to keep on recording events day by day, keeping up to date on my web site is less of a priority. You are currently browsing the Re-photo blog archives for August, 2014.